by James H. Taylor, Sr. I had been searching and asking about getting a special type of rosary. I don't know how I came across Lottie's web page, but I immediately contacted her with my desire. She patiently talked and walked me through what I wanted, and what she could provide. The latter part was the best. She started recommending changes. After I told her to use her better judgement, she sent a description of what it would look like. I told her to go ahead and make it. The next to the last surprise was her explaining the meaning of purple color. Wow!!! Recently, I was reading the bible, and and the latest surprise happened. Revelations 21: 19-21 jumped out at me like Lottie's voice. 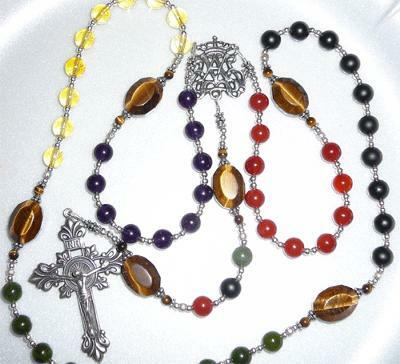 Although my custom design doesn't use all the different stones, my rosary is most precious to me when I pray it. Before I begin, I kiss the Tiger Eye between the 1st and 2nd decade, and say "God, Bless Lottie Dorsey". Join in and write your own page! It's easy to do. How? Simply click here to return to Magnifcatrosaries.com.